Dog agility is a dog sport in which a handler directs a dog through an obstacle course in a race for both time and accuracy. Dogs run off leash with no food or toys as incentives, and the handler can touch neither dog nor obstacles. 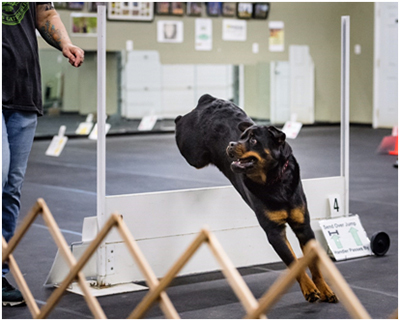 Consequently the handler’s controls are limited to voice, movement, and various body signals, requiring exceptional training of the animal and coordination of the handler.